Executive Boardroom, with a flat-screen TV, dry bar and can host up to 14 people. Have a Roadshow? We’ll follow you! SW Audio+Visual is a province-wide company. You can ensure your event proceeds without a hitch by having SWAV be your Roadshow Provider. In choosing this option, you will ensure consistent set-ups from city-to-city, which translates into a very confident, well-presented and impressive event. From stage sets, projection and lighting to exceptional sound and video, the SW Audio + Visual team at Delta Burnaby Hotel and Conference Center is your in house event support solution. For all your conference, meeting and event service needs call us anytime to discuss your project at 604-327-5878 or 1-855-789-7928. The Audio Visual Concierge Program at the Delta Burnaby Hotel and Conference Center, provides meeting planners the comfort of knowing they have a dedicated in house AV professional committed to ensuring their meetings and presentations are successfully and professionally delivered. Your AV Concierge at the Delta Burnaby Hotel and Conference Center will be visible to you, your presenters and hotel staff, providing a single point of contact and being immediately accessible for any concerns or questions that may arise. 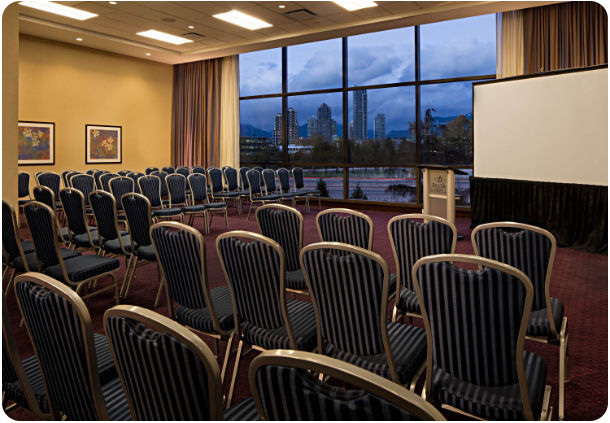 The Delta Burnaby Hotel and Conference Center AV Concierge comes equipped with the latest audio visual equipment and tools along with the experience to help your meeting run stress free.